For Smokers, Quitting May Be Contagious Think the decision to smoke or quit is solely a personal matter? Think again. Researchers have found that relationships, even many degrees removed, can have a big influence on behavior. Last year, Fowler and Christakis made waves with research that suggested your friends might be making you fat. Read that story here. A random sample of 1,000 study subjects in 1971 and 2000. Yellow nodes designate smokers (with the node size proportional to number of cigarettes consumed); green nodes are nonsmokers. Orange arrows denote friendship or marital ties; purple arrows, family ties. In 1971, there are many more smokers and they are dispersed throughout the social network. By 2000, there are not only fewer people smoking, but they have also been pushed to the outside of their social groups. For better or worse, friends and family members can influence your health. If a close friend or spouse quits smoking, you're more likely to quit, medical experts say. But what if your friends' friends give up cigarettes? A recent study shows that the influence of social networks extends much further than you might think. Sheila Jennings and Tom White met a few days ago on the patio at an outdoor cafe in the Adams Morgan neighborhood of Washington, D.C. She opened a pack of cigarettes and asked White, who was seated nearby, if he minded. White had no objections — he's a smoker, too. A few minutes later, White ran into his friend Rusty Sticha — who doesn't smoke anymore — walking by the cafe. Sticha says his girlfriend encouraged him to quit. But is it possible that her influence could have an effect on White? Or even on Jennings? It's likely, according to two researchers who conducted a study on the dynamics of social networks. "There's no doubt that people are influenced by the behaviors of individuals that are not just one degree of separation from them, but two and three degrees of separation. There's a kind of cascading influence," says Nicholas Christakis, a professor at Harvard Medical School and a co-author of the study, which appears in Thursday's edition of The New England Journal of Medicine. Christakis and James Fowler, a professor at the University of California, San Diego, have documented this cascading effect. Their work began, somewhat serendipitously, when they stumbled upon a trove of paper records from a heart study launched in the town of Framingham, Mass., in the early 1970s. Thousands of people in the town had shared information about whether they smoked. They also had given researchers contacts for spouses, friends, siblings and places of employment. "We were able to recover these paper records and computerize them and reconstruct the social ties of a total of 12,000 people," Christakis says. The records were a gold mine of information: They included three decades' worth of updates, including changes in workplaces, addresses and phone numbers for close social contacts, as well as documented changes in smoking behavior for many of the interconnected people. "Not only for any given individual did we know who their friends and family and co-workers and neighbors were, but for those friends, families, co-workers and neighbors, we knew who their friends, family, co-workers and neighbors were," Christakis says. "So we were able to go out well beyond six degrees of separation and therefore begin to tease out the spread of smoking behavior through the social network." Christakis' and Fowler's study revealed that the smokers and nonsmokers tended to form separate groups and that smokers gradually became less central in the social networks. It also found that the closer a relationship was — between spouses, for example — the more likely that a decision by one person to quit smoking would influence the other. But Christakis says there's more here than just a simple copycat effect. The study showed that people quit smoking in clusters, almost as if there's a form of hive intelligence or synchronicity at work. What may be most interesting about the social network findings is who was still smoking at the end of the study. In 1971, when the heart study began, smokers were as likely to be positioned at the center of a social network as nonsmokers. Fowler, the study's co-author, likens it to standing at the center of a group of 10 people at a party. "But by the end of the party, by the end of our 32-year study," Fowler says, "the people in the center of the room are not smoking. And the people who continue to smoke have been literally pushed to the outside of the party, so that they're in places where they're only connected to one or two other people." White, who was at the café, says smokers do feel isolated these days. But, he says, "I don't have any choice. ... I don't like it but ... I'm willing to stay here." This thinking worries Dr. Steve Schroeder, director of the Smoking Cessation Leadership Center at University of California, San Francisco. He says the more smokers segregate themselves, the harder they may be to reach. "Only about 3 percent of smokers who try to quit can quit on their own," Schroeder says. But this new knowledge of the power of social networks could create possible solutions to help isolated smokers quit. Those relationships may serve as another tool, along with medicine and counseling, to further reduce smoking rates. Call it positive peer pressure. A new study suggests that your best friend's weight may be very influential in determining whether you'll gain or lose weight over the years. The research documents the spread of obesity from person to person in a study of more than 12,000 people. Helen Hancock, a nurse in Washington, D.C., is trying to take off the weight she has gained over the years. 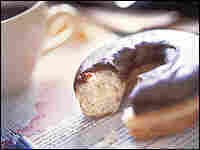 She says it's hard to resist the Krispy Kreme doughnuts that one of her friends brings into the office every Friday. "They smell wonderful," says Hancock. "It's not just one doughnut you eat. It's generally two doughnuts!" Many of us face office temptations. But researchers think there's more to the spread of weight gain than simply copying a friend's food choices. "Sharing a doughnut is obviously important," says James Fowler, Ph.D., who studies social networks at the University of California, San Diego. "But what's even more important are the ideas that we share with one another." Our ideas about what's a normal amount of food or exercise, and what counts as a normal body size, all seem to be influenced by the people to whom we're connected. And researchers believe these "norms" ultimately shape our weight. Fowler teamed up with Harvard Medical School's Dr. Nicholas Christakis to study this phenomenon. Together, they documented the spread of obesity in one town in Massachusetts. 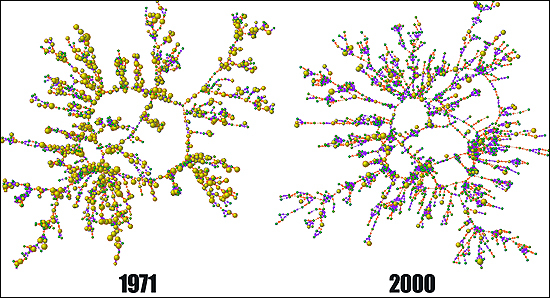 Christakis and Fowler used data collected by the long-term Framingham Heart study to recreate a social network. This study included pairs of spouses, groups of siblings and next-door neighbors. Researchers even had old paper records where people had written down the names of close friends. "What we were able to do is computerize these archived, handwritten records," Christakis says, "and reconstruct this densely inter-connected social network." The people in the Framingham study gained weight at about the same rate as the rest of America during the 30 years they were studied. And once Christakis and his colleagues assembled a bird's-eye view, they discerned patterns. But Christakis says they found the strongest patterns among friends. Researchers found that a person's chance of becoming obese increased by 57 percent if that person's close friend became obese. If it was a sibling or a spouse, the person's risk went up by more than one-third. Next-door neighbors, however, had no influence at all. The results appear in the current issue of the New England Journal of Medicine. If the scope of this social influence is impressive, Christakis says the beauty is that it seems to work in both directions. "The same kinds of phenomenon that contribute to an obesity epidemic could potentially be harnessed to the reversal of it," he says. That's because researchers also saw that when one person loses weight, it contributes to other people around them losing weight, too. Experts say this study shouldn't be used to blame fat people for making other people fat. "There's enough stigma already," says Kelly Brownell, Ph.D., a researcher at Yale University. A lot of factors influence obesity. Genes have a strong influence, as does income. Brownell says he would like to see more focus on prevention. Since there's a domino effect to weight gain and weight loss, researcher James Fowler says people can use this to their advantage. The take-home message here, says Fowler, is that if you're interested in losing weight, "you really need to get your friends and family involved in the process." Click here to see how smokers moved to the outside of their social networks.